Suzanna Fatyan, one of Uzbekistan's finest tour guides, has contributed several pieces on this website about Samarkand as well as about Uzbek cuisine. 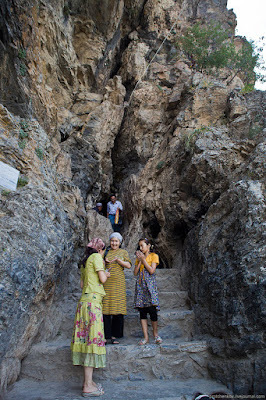 In this article she takes us to the holy pilgrimmage cave of Hazrat Daud, not far from Samarkand. In the Mirankul Mountains, forty kilometres from Samarkand, there is a legendary cave revered by members of different religious faiths. The cave is actually a narrow, 30-metre corridor. The flow of pilgrims, striving to touch the handprints left by Hazrat Daud (David) on the walls of the cave, never dries up. Uzbekistan has always been a centre of spirituality. Real, historical personalities as well as heroes of sacred writings, legends and myths marched through its territory leaving their traces. Uzbekistan was a meeting point of many religions: Zoroastrianism, Judaism, Buddhism, Christianity and Islam. King David (Daud) is deeply respected by Moslem mystics. The entire world knows the story of David, the hero who slew Goliath. He became a warrior king and the ruler of the United Kingdom of Israel (circa 1043 BC - 937 BC). He has gone down in history as the direct patrilineal ancestor of the Messiah, the author of Psalms and the father of King Solomon. King David is one of the most significant personages of the Old Testament. His charismatic personality is described in masterpieces of prose, drama, poetry and music. His noble image is portrayed in paintings and sculptures. The Old Testament describes David as a complex character, a rich and full personality. He is endowed with wisdom and many talents. On the other hand, he is impulsive and able to make mistakes at his expense. David was a shepherd when he killed Goliath with a stone from his sling. He married King Saul's daughter and became friends with Jonathan, Saul’s son. David gradually turned into an epic hero whose incalculable achievements eclipsed Saul himself. Saul began to view David as his rival and David had to escape, hiding himself in the desert, in the mountains and in the forest. According to Arabic sources, David was sent to Asia to preach monotheism. 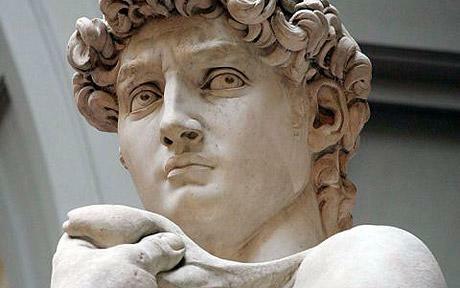 At different stages of David’s saga, his image undergoes substantial transformation. The distinction between the interpretation of David’s life history in the Old Testament and in the Koran is crucial: the Koran recognizes him as an absolutely righteous man. This is supported by the Islamic Encyclopedia which stressed that the Koran mentions Daud - David - as the righteous man specially favoured by Allah, and as a prophet bestowed with power, wisdom, eloquence and a beautiful voice. David is the author of psalms (zuburs); mountains and birds are subordinate to him and glorify the greatness of Allah with him. David is the first man to work metal and make chain armour and weapons (Saba 34:10, 34:11). For this reason, Daud is considered the patron of blacksmiths in Uzbekistan. The Koran has references to the combat between Daud and Jalut (Goliath). The post-Koranic accounts tell about conflicts between Daud and Talut (Saul) and confirm Talut's attempts to kill the hero. 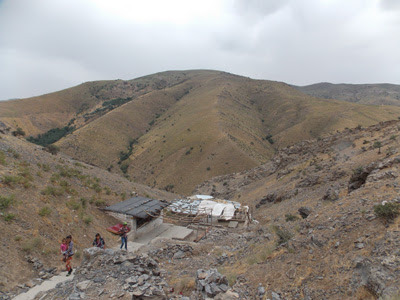 According to many legends, the mountain refuge of David is located in the vicinity of Samarkand. It still bears the traces of his presence - his handprints. It is believed they were made when David, with the help of God, was pulling apart the rocky mountains. The cave of Hazrat Daud attracts crowds of pilgrims from every corner of the world. In order to reach the cave, they have to climb the 1300 steps. This is a symbolic reminder of the way each person has to travel to achieve spiritual perfection, self-knowledge and enlightment. The path to spiritual perfection is thorny, but necessary, if you wish to perceive the essence of life, the beauty of the world. The closer you come to the cave of Daud, the more beautiful the scenery appears before your eyes. The more advanced your spiritual state, the better the world becomes around you. A small mosque stands near the mazar (shrine), and prayers are recited non-stop there. Inside the cave, the soul’s communion with supreme forces takes place, solemnly and mysteriously. Pilgrims light candles, touch David’s handprints and ask him to fulfill their long-cherished desires. The aspirations of members of different religious communities meet and unite here, suggesting that many nations draw spirituality from one common source. If you are unable to climb the stairs, locals offer donkeys or horses for hire. Along the whole length of the stairs there are little stalls selling water, mountain herbs, skins of wild animals and religious souvenirs. There are also small restaurants or you can bring your own picnic.